30-May-2010 -- It took a while to find an unvisited confluence in Alaska that was somewhat accessible from the Fairbanks region. The confluence we set off to find was 149W, 69N, four and a half miles off the highway. To get to the site we had to drive ten hours north on the Dalton Highway across the Yukon River and through the towering Brooks Range until we were only 80 miles from the Arctic Ocean. We set off at 6:30 am and stopped to camp around 6:00 pm at a BLM campground on Galbraith Lake. The drive through the Brooks Range is gorgeous. The next day we drove another hour, parked, and set off with two dogs joining the adventure. We started hiking at Noon at an approximate rate of 2 miles an hour estimating it would take us two hours to reach the confluence. But hiking on the tussocky tundra took twice as long as expected. It didn’t help that we had to cross several small streams (and one large one, where we got wet up to our waists) and a large portion of the tundra was soaked with spring snowmelt. Even though we were hiking up in late May, there were still large snow patches that we had to wade through. We sunk in up to our thighs and pulled our legs out to find our feet soaked up to the ankles. It was a fairly arduous trip. The only pleasant surprise was the lack of mosquitoes. Although mosquitoes are thick as far north as Wiseman, up by the confluence they haven’t hatched yet. So we probably missed swarms of the “state-bird” by a matter of days. We didn’t miss out on other wildlife, though. We encountered a moose, red fox, lynx, porcupine and hares all along the highway, and ground squirrels and several species of bird along the hike. Happily, we saw only bear poop and no bears while miles from the car, and armed with only bear spray. The confluence itself, predictably, was unremarkable. But what a relief, however, that it was neither in a stream or a lake (of which there are several in this area) but on semi-solid soggy ground. We got back to the car at 8 PM and drove four hours to get a midnight dinner at the Truckers Café in Coldfoot. We had planned to camp out somewhere along the Dalton that night, but the bugs were so bad we couldn’t bear to set up a tent with them swarming. So we drove from Coldfoot to Fairbanks, arriving home at 6 AM. Two long days of driving broken only by an 8 hour hike. Thankfully, due to the time of year, it never got dark, so it was a beautiful trip home. #7: Ice heave exposing permafrost near the confluence. #9: Along the Dalton Highway on the way to the confluence. #10: The view when hiking back to the car. 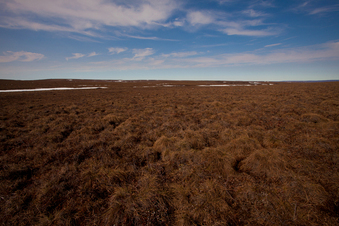 The Dalton Highway and pipeline are in the background.